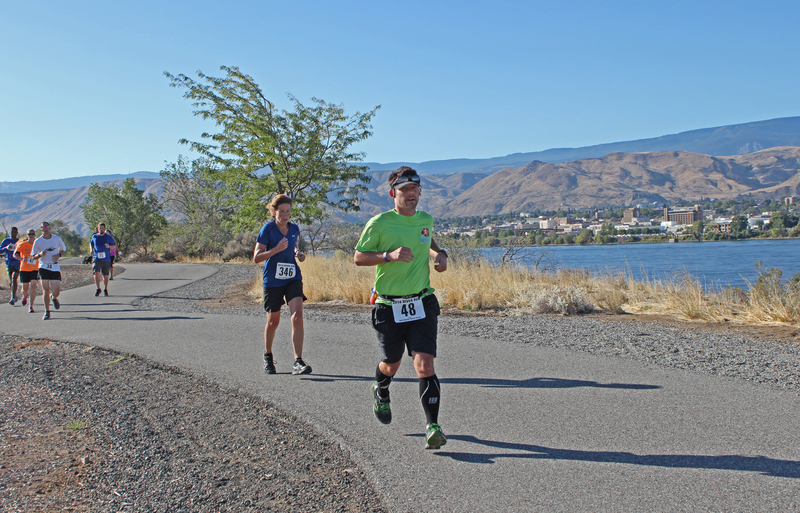 River Run half-marathoners move along the Apple Capital Loop Trail in East Wenatchee on Saturday. WENATCHEE — At 11 years of age, Ella Loewen is relatively new to the running world. 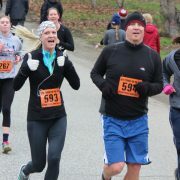 Prior to Saturday’s River Run, she had completed two 5Ks in her life — Turkey on the Run and the Bundle-Up Run. On Saturday, under glorious blue skies and summer-like temperatures, Ella had her best finish yet — second place in the women’s 5K — and completing 3.1 miles in an impressive time of 23 minutes and 44 seconds. Her mom, Heidi Loewen, did her daughter one better — finishing first in the women’s 10K race in a time of 44:09. 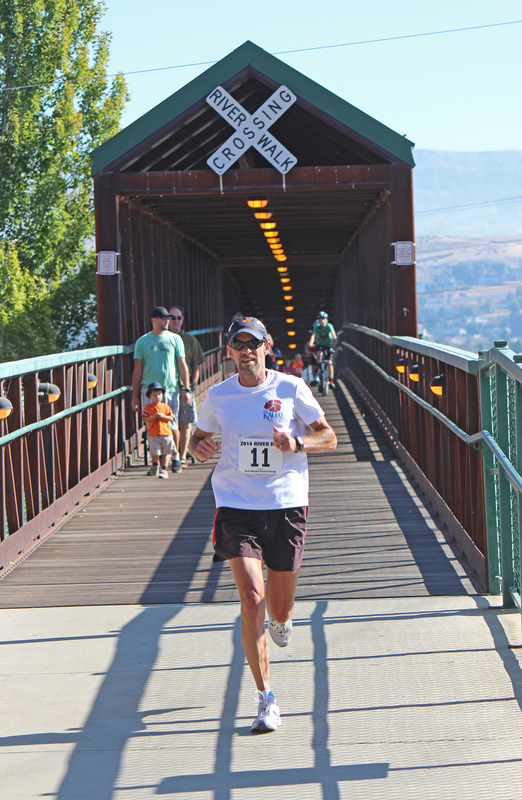 Men's half-marathon winner Brent Biggar near the finish line on First Street in downtown Wenatchee on Saturday. 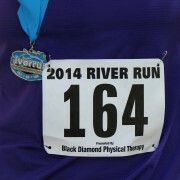 The Wenatchee daugther-mom pair were two of about 365 people who registered for River Run, presented this year by Black Diamond Sports Therapy and held in conjunction with the Taste of the Harvest Festival. It was the largest turnout in the event’s 5-year history. The River Run courses take participants from Pybus Public Market to the East Wenatchee side of the Columbia River and then back to the finish at the Taste of the Harvest Festival in downtown Wenatchee. Race director Joel Rhyner credited volunteers for such a smooth event. In addition to Heidi Loewen, other race winners included Brent Biggar of Wenatchee in the men’s half-marathon; Jennifer Koga of Kelowna, B.C., in the women’s half-marathon; Phillip Hochwalt of Wenatchee in the men’s 10K; Armando Bendito of Wenatchee in the men’s 5K; and Christine Quantz of Soap Lake in the women’s 5K. Biggar broke out to an early lead and was never threatened. He finished in a time of 1:31:04. “When you run from the front like that, you never know what’s behind you, at least until the turnaround. Then you can evaluate,” he said. Taking second in the men’s half was Peter Kuipers of Platte, S.D., in 1:38:32. Wenatchee’s Eddie Edwards was third in 1:40:23. Koga, a Kelowna resident who traveled with her family to do the race and take in the Taste of the Harvest Festival, said she has slowed down as a runner after giving birth to her son. She was clocked in 1:45:38. Runner-up KaLeigh Krings of Lewiston, Mont., was timed in 1:50:20 and third-place finisher Laura Martinez of Cashmere in 1:50:39. “It’s such a beautiful course,” Koga said. Others had a similar take. 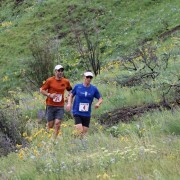 “It’s a beautiful landscape and a really fun run. I’ll definitely do it again,” said Bendito, the men’s 5K winner from Wenatchee. Women’s 5K champ, Christine Quantz of Soap Lake, crossed the finish line in 21:12 and said afterwards it was a victory for her on several levels. For the past three years, she has been battling first a tibia stress fracture and then tendonitis.